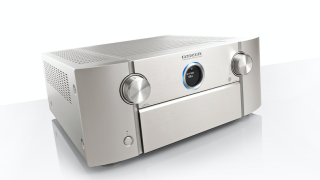 Marantz launches new receivers with 3D sound and AirPlay 2 | What Hi-Fi? The full line up includes the AV8805, AV7705, SR8012, SR7013, SR6013, SR5013, NR1609 and NR1509. Marantz has announced a range of new amplifiers that will support AirPlay 2, 3D sound formats and Amazon Alexa. At Sound United’s annual European Dealers Conference the company revealed the new 9-channel SR6013 (£1250) and SR7013 (£1749) amplifiers, alongside the AV8805, AV7705, SR8012, SR5013, NR1609 and NR1509. These receivers will make up Marantz's 2018-2019 lineup. The SR7013 is built on the Marantz Hyper Dynamic Amplifier Modules (or HDAMs) that we've seen in the company's other products, and gives 200W of power per output. Many of these amplifiers will support 4K HDR passthrough, so you can watch all the latest 4K Blu-rays in comfort. They'll also work as part of the Denon HEOS multiroom ecosystem, as well as with Spotify Connect, Bluetooth, internet radio stations and the aforementioned AirPlay 2. For greater dimensionality with your sound, the receivers will have Auro-3D support built-in, as well as supporting Dolby Atmos (up to a 7.1.4 channel setup) and DTS Virtual:X - although some receivers may require updating to get full compatibility. Amazon Alexa support - the artificial assistant in the Echo range of products - is also coming, so you'll be able to control your music using voice commands. How much you'll actually be able to control the receivers remains to be seen, but we'll update you when we know more. Watch this space.